It might not seem like it right now, but spring turkey season will be here before we know it. Now is a great time to think about what you can do to maximize your chances of success. Here are some tips to help you make the most of your next turkey hunt. Scout out where you plan to hunt before the season starts. Try to get an idea of where the turkeys will be roosting at night, and where they will go to feed during the day. Knowing where they roost will give you advantage when it comes time to hunt, as you’ll know where to go to cut the birds off on their way to their feeding areas. 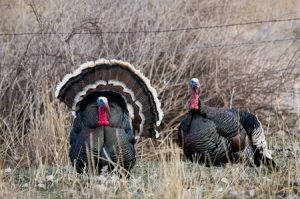 Better yet, if you’re looking to bag a Merriam Turkey in New Mexico, JACO Outfitters can put you in the area and do all the prep work to harvest your bird. Whether you’re attempting a gobble, clucks or other calls, making realistic turkey calls with your mouth and vocal cords is a lot easier said than done. Listen to call sounds online and watch instructional videos to help you master your calls. Then, practice, practice, practice! You can even record yourself to get a sense of exactly how you sound so you can perfect the calls. If you’re using a slate or glass call, make sure it is tuned in advance of your hunting trip. JACO Outfitters is highly experienced and can take care of the calling if you’re not as proficient as you need to be. It’s important to practice with your turkey hunting guns in the offseason so you don’t get off to a rusty start. If you haven’t used your turkey gun in a while, your first hunt may be a difficult one. Shoot clay birds and targets with your turkey gun in the meantime, and practice while wearing your gear to make your training as authentic as possible. If you’re looking for a great turkey hunt experience with an expert guide, contact us at JACO Outfitters today! We conduct guided Merriam turkey hunts in the Sangre de Cristo Mountains of north central New Mexico. Our hunts include 3 full days of hunting and all your lodging, meals, transportation to and from the hunting grounds with 2×1 guide service.